Hey Ya’ll! It’s Friday! I’m about to head out for another short vacation! Stay tuned for lots of photos and food adventures! 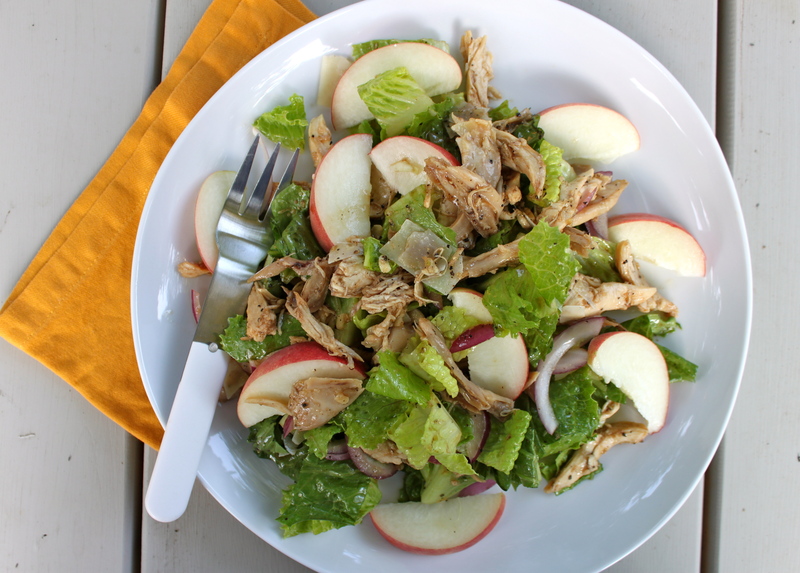 In the meantime, check out this easy recipe for Fig Balsamic Chicken Salad with Fresh Summer Peaches! Summer is a really great time to experiment with fruity olive oils and vinegar. You can find a variety at The Fresh Market. I always check out what they have in stock and what is on sale. My favorites are Fig Balsamic Vinegar, Blood Orange Olive Oil and Truffle Oil. They are great in vinaigrettes, on popcorn and even drizzled over ice cream with sea salt! I highly recommend Blood Orange Olive Oil over vanilla ice cream with Maldon Sea Salt. Your friends will think you’re a genius (I stole this from my friend Debbie!). This recipe also utilizes the rotisserie chicken but could also work with grilled chicken too. The trick is to shred the chicken right when you get home and store it for use all weekend. This salad was a super last-minute supper and it was made part by my advance preparation! Enjoy any variation of this with different lettuces, fruits, cheeses and vegetables. This is even better eaten outside in the garden – rain pending. It’s great solo or for a nice casual evening with friends. Serve with good bread! Dressing: 2 tablespoons fruity balsamic vinegar, 1/2 lime juiced, 1 teaspoon local honey and 2 tablespoons good olive oil. Season to taste with salt and pepper.